This tiny parasitic wasp is a member of the Chalcidoidea superfamily, which is now–along with many if not most taxonomical groupings–under constant revision as more is learned about the underlying molecular systematics. The Chalcidoidea is presently subdivided into nineteen families, including the Encyrtidae, within which the subject species is currently grouped. The chalcids are members of the order Hymenoptera (derived from derived from the Ancient Greek roots ὑμήν [humen]: “membrane” and πτερόν [pteron]: “wing.”) These insects usually have two pairs of wings, with chewing mouthparts that have well-developed mandibles. Many have mouthparts that have further developed into a complex and lengthy proboscis, enabling them to drink nectar and other liquids. Hindwings connect to forewings by means of hooks called hamuli. The eyes are compound, which are typically supplemented with three ocelli. The order Hymenoptera includes the sawflies, wasps, bees, and ants, and is one of the largest insect orders with over 130,000 species presently recognized. Chalcid hymenopterans are one of the largest superfamilies in the order, containing some 22,000 recognized species, though as many as 450,000 species are believed to remain undescribed. Most chalcids are parasitoids of other insects, which means they attack and, rather than leave their hosts alive, kill their hosts outright, exploiting their bodies as a means of propagating their species. Some are phytophagous, such that their larvae feed inside seeds, stems, and galls. Practically all chalcids are beneficial to humans, due to their predation on crop pests. Many have been imported from their native habitats to control specific insect pests. The family Encyrtidae is a large family of parasitoid wasps with over 450 genera and 3,700+ recognized species. Most are primary parasitoids of hemipteran hosts, though some attack other hosts. Each species tends to specialize in terms of the stage of development of the host (i.e., egg, larva, or adult) at which the host is attacked. Some species exhibit polyembryony, wherein a single egg multiplies clonally in the host, producing numerous adult wasps identical to each other. In some, certain larvae–being much larger than the othrs–behave as altruistic soldier larvae that attack other wasp larvae present in the host, and later die without reproduction. Encyrtids are are distinguished by their prominent, thickened antennae (a character shared by some other families of chalcids), by features of wing venation unique to the family, the positioning of the cerci on the forward portion of the metasoma and the consequent distortion of the tergites, and a remarkably enlarged mesapleuron whose mesacoxae are positioned anteriorly. This species (Pseudaphycus angelicus) is distinguished by having white tips on its thickened antennae, and is best known as a parasite of the grape mealybug (Pseudococcus maritimus.) 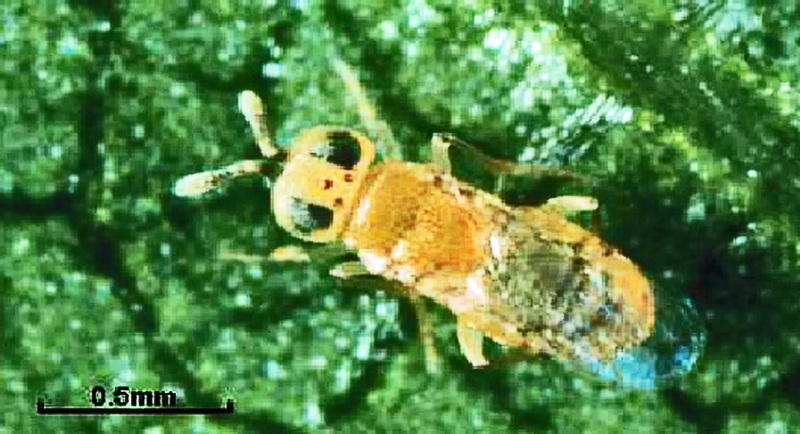 A number of chalcid wasp parasites of the grape mealybug are known, including Acerophagus notativentris, with whom Pseudaphycus angelicus is sometimes confused. Pseudaphycus angelicus was first described by a middle-aged USDA entomologist, Leland Ossian Howard (b. June 11, 1857 – d. May 1, 1950), in 1898. Over his lifetime, Howard is said to have described over 47 new genera, and 272 new species of insects. Three species of mealybugs, commonly known as grape, obscure, and longtailed mealybugs, and all in the genus Pseudococcus, infest vineyards in the United States. The grape mealybug is most common in California, but is spreading to Washington and Oregon, and is also a serious pest of apple, pear, peach, and grape throughout the U.S. west coast, as well as an occasional pest of orchards and vineyards in the midwestern and eastern regions of the U.S., and in eastern Canada. Several parasitic wasp species are known to attack grape mealybugs. Though research on these parasites has been sparse, they are believed to play an important role in keeping mealybug populations in check. However, because Cryptolaemus montrouzieri, a lady beetle known as the mealybug destroyer, appears even more effective in controlling these pests, Pseudaphycus angelicus and another parasitoid, ec, have taken a back seat to that predator. Besides Cryptolaemus montrouzieri, Pseudaphycus angelicus, and Acerophagus notativentris, Cecidomyiid flies, lacewings, minute pirate bugs, and a number of spiders also prey on mealybugs. Photo © Max E. Badgley, published with permission from the Max E. Badgley Estate, with special thanks to the University of California, Riverside, who kindly supplied this image from the UCR Chalcidoidea database collection. The Max E. Badgley Estate retains exclusive copyright to each image. The Estate encourages the use of these photos for non-commercial purposes, however, and freely permits such usage provided attribution to Mr. Badgley is given with each use, referencing the Max E. Badgley Estate, following the basic format provided with the photograph shown here. Persons interested in using these images are urged to contact Jerry Cates (jerry.cates@bugsinthenews.info) who presently serves as curator of the Max Badgley insect image collection.